Socks are easy, mostly mindless, and quick to accomplish. There’s something to be said for feeding my desire for instant (well, relatively speaking) gratification. That said, they are also very good for trying out new techniques. I have a LOT of sock yarn – each selection just enough for 2 socks, and not really enough for a more substantial project. Yet, I don’t really care for the finished project – mostly because the only time I wear socks is in the deepest of winter. I suppose it’s a good thing that’s where things are, right now at 17° (F) on a mid-January morning. Pattern = Crystals, Combs and Cable Socks (Free Ravelry download) – This is a pattern I’ve made a few times, and enjoy. 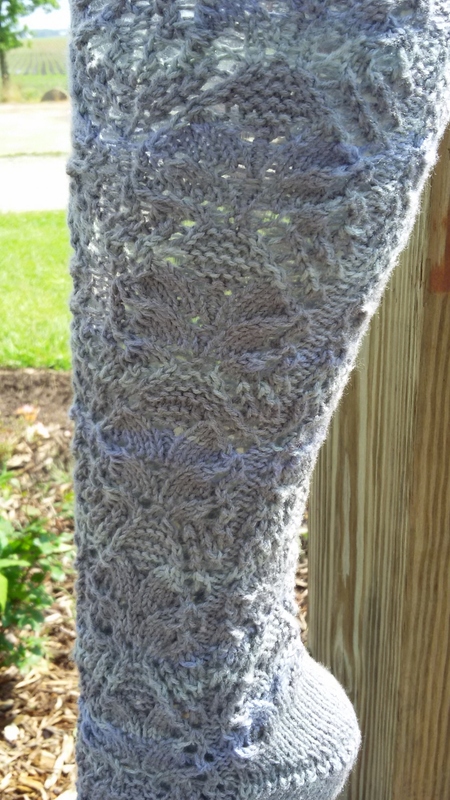 Fairly quick, interesting, and I like the heel treatment – short row heel that gains texture by use of garter stitch. I don’t add beads, mostly because I’m not a “bead person,” and I don’t think it adds to the pattern. Yarn – Noro purchased in Toronto, but a commonly available in most boutique yarn stores (that is, not found at Hobby Lobby or Michael’s). Not sure of the color – I lost the yarn band. Yarn = Patons Kroy Socks FX in color Cameo Colors. I’m wondering if the previous “sock fail” was also a Paton Kroy sock color – the look and feel was the same (the twisted tweed colors). While I didn’t get sock pooling with this project, I certainly did not get matching stripes. They almost look like two entirely different socks! Pattern = Nutkin (Free Ravelry download) – also a pattern I’ve done a few times before (including the aforementioned sock fail). I’m sure I’ve used Patons Kroy Sock (generally available at JoAnn’s and Michael’s) yarn a number of times, previously. Not sure why I’m getting unsatisfactory results with the current projects. I have one more “set” of this style yarn in my yarn stash – I wonder how it will work up? Well, it was the yarn. These ended up in the “donations to the Thrift Shop” bag. I admit, it is better than the previous version, but I still could not get rid of the yarn pooling. The bands on each sock were very different, too, which annoyed my sense of symmetry. Link to previous post about reclaiming yarn. 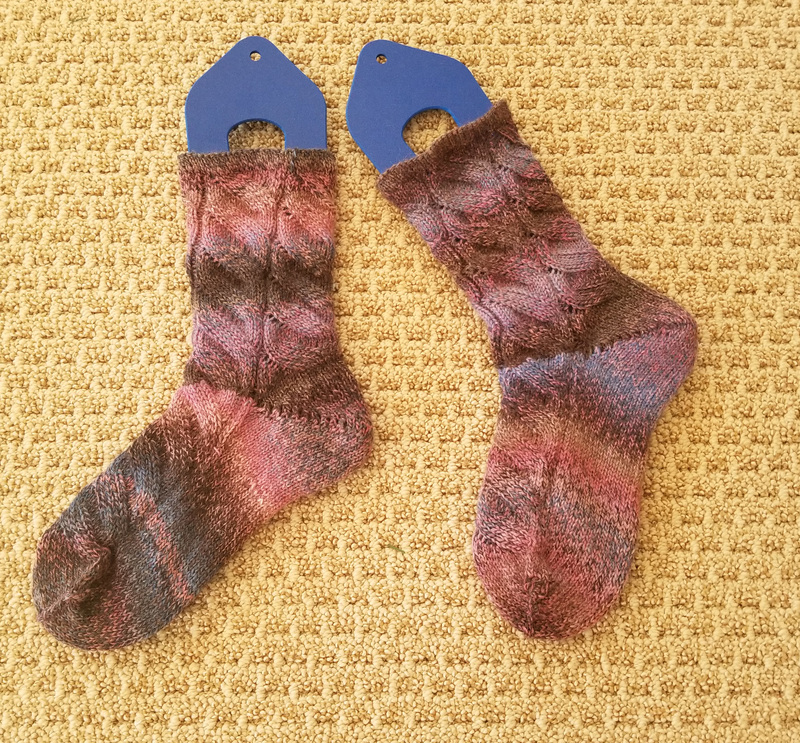 This project dates back to August (see post), and was a “learning” project as much as a sock project. 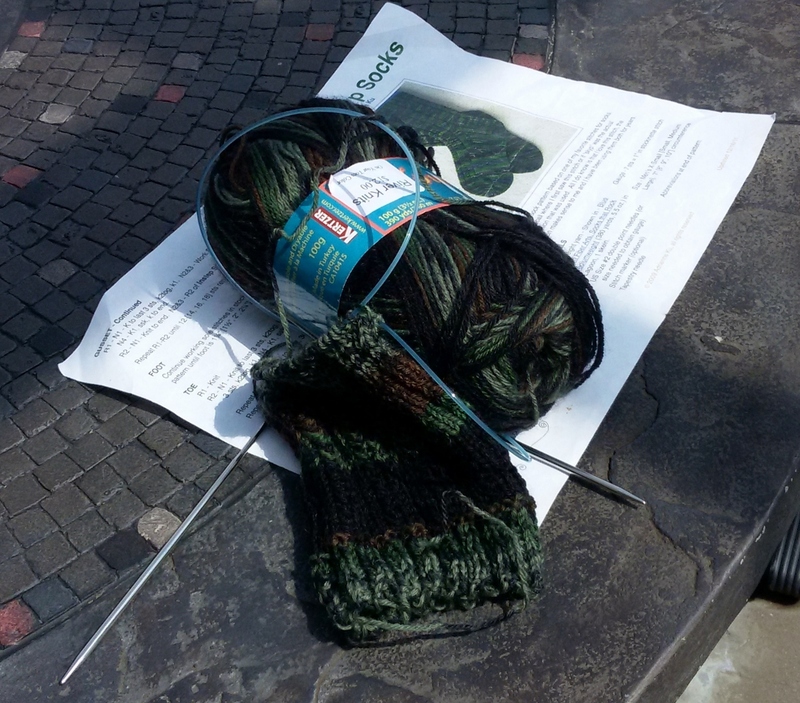 Turkish Cast-on with one Circular Needle – my new favorite toe-up sock cast-on method. Knitting on Circular Needles (instead of DPNs) – Also my new favorite technique. While the cable for the circular needle sometimes gets in the way, this technique is much safer and more stable for me than trying to manage DPNs. Project Progress by the Gram – as a toe-up sock, with a yarn that was enough for two socks in one skein (Berroco Comfort Sock Yarn), it was an interesting experiment to knit “half the yarn” and then start the next sock. 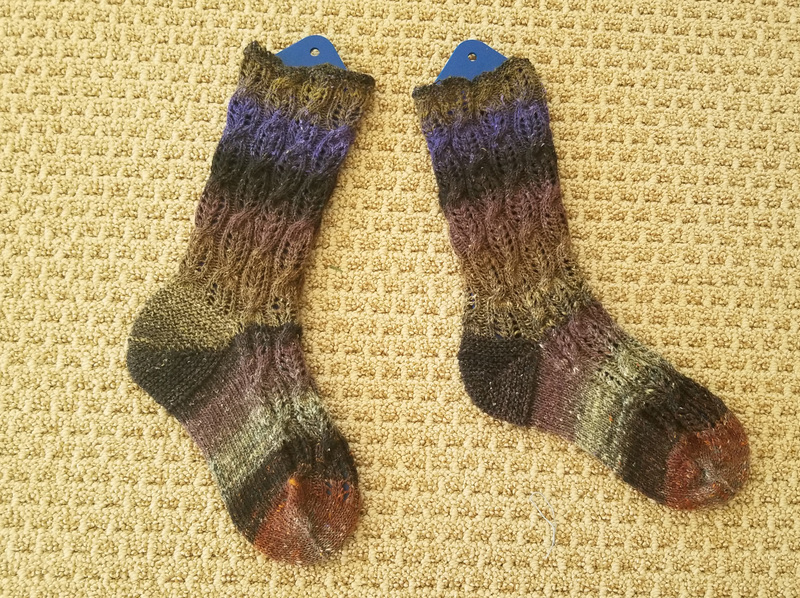 That mostly worked – I ran out of yarn right at the ribbing of the second sock and had to find something that would coordinate and complete the project. I considered unraveling half of the ribbing for the first sock, but discarded that idea as being unnecessarily complicated. As it happens, I kind of like the result – the scrap yarn I used coordinated perfectly, and almost seems intentional. There was a lot of yarn. This is a knee sock! 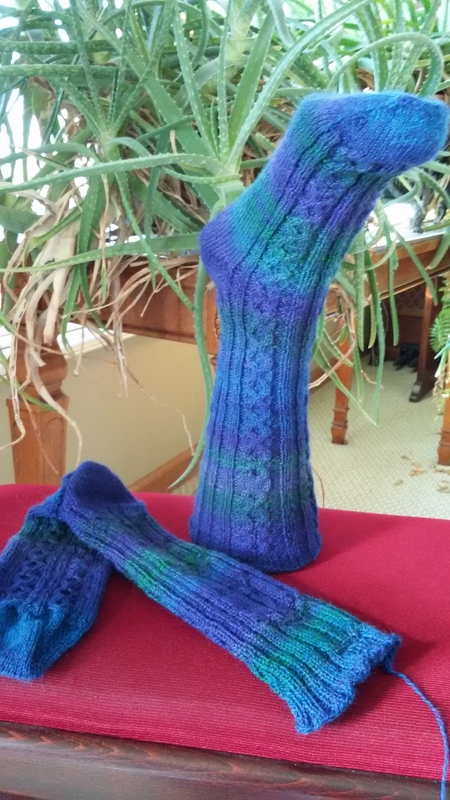 Something else that worked out unexpectedly – the yarn pattern matched up perfectly in the sock. That made my day. All in all – a thoroughly enjoyable (if slow to completion) project, and I learned several new techniques that will have a permanent place in my knitting repertoire. I have very much enjoyed this project. The instructions are clear, the intervals (between one section and the next) are manageable, and the sock is terrific. Thanks, KnitPurlHunter! I’m sorry to report that I don’t have WIP photos. The project was so fast and so fun (and my day gig is starting to get busy), I didn’t a chance. So, here is the completed project! Socks using a single circular needle are probably going to be a permanent part of my repertoire. I feel that I have a lot more control. (That said – I’ll be interested to observe my experience the next time I knit cuff-down socks. I’m not sure how I’ll manage the toe decreases). However, this is my third sock using a single circular needle that knit up larger than expected. I must be using a circular needle differently than DPNs, and I need to figure out how to adjust. Turkish Cast On for toe up socks is much easier (for me) than Judy’s Magic Cast On (IMHO). With apologies to knitting technique pioneer Judy Becker, the Turkish Cast On is easier for me to manage and remember. German Short Row Heel – the way to go as a terrific alternative to the traditional knit heel (particularly for toe-up socks). Michelle Hunter’s instructions are the best. If you look closely, you’ll notice that I did not bow to my usual obsession to have the stripes match. This particular varigated yarn pattern does not seem to have regular repeats, and the color chages are gradual enough to not trigger my need for balance. Besides, I plan to gift these socks, so I probably won’t see them to notice. Slow to start, but once I finally got onto the pattern, it went quickly. I originally thought the pattern too busy and distracting, but after working it up, I really enjoy it. 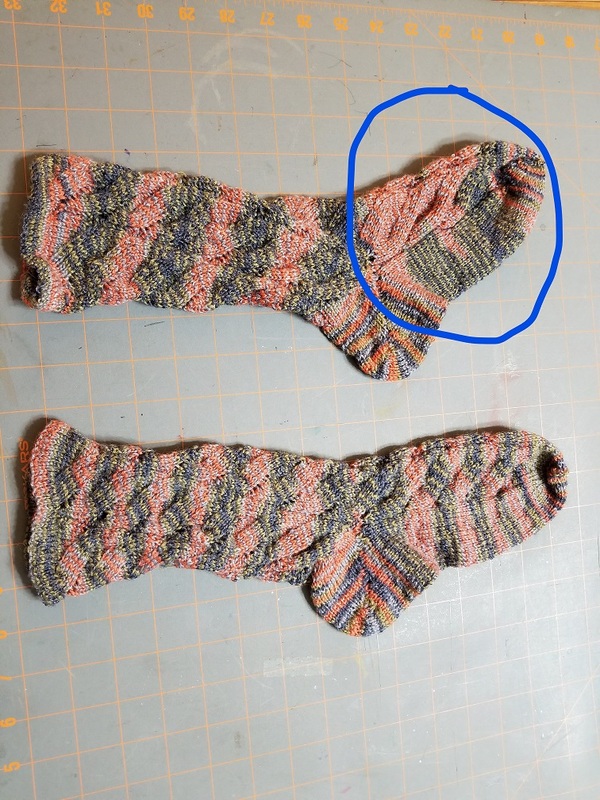 Using one circular needle for socks – new favorite technique for sock knitting! While any technique has its appeals and frustrations, knitting with a single circular needle allows more secure project management – meaning, no stitches dropped off the ends of the DPNs, no cramming too many stitches on a DPN, no lost stitches when on the go. Still don’t know why this project knit up a good bit larger than expected. Definitely wearable, but plenty big. I really liked the way the pattern continued on to the heel stitches. Very interesting and appealing use of pattern. Detail of “falling water” pattern. Kudos to the designer for a creative project! Pattern: Cachoeira, found at Knitting Magazine. Yarn: Knit Picks Stroll Tweed in color Lost Lake Heather. Machine washable, shows detail well, 65% Superwash Marino Wool, 25% Nylon, 10% Donegal (which accounts for the tweed).